You’ll do more than handle financial records and balance budgets with an Online Master of Professional Accounting Degree from CSU-Global. Our program is designed to prepare you to be a Certified Public Accountant (CPA), as well as an effective leader in public accounting, corporations, government agencies, and other fields. By becoming a licensed accountant by your state’s Board of Accountancy, you can advance quickly within your field. Develop accounting strategies to solve organizational problems and improve performance. Apply qualitative and quantitative analyses in decision making and problem solving. Evaluate and manage ethical and legal conflicts or issues. Adapt accounting methods and practices to meet the needs of employees and leaders within an organization. Analyze and apply economic and financial concepts, principles, and theories to problems and opportunities. Communicate effectively on business issues and various corporate situations. 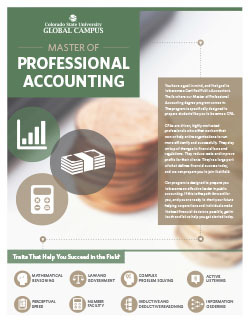 Designed to prepare students for the Certified Public Accountant (CPA) exam, the Online Master of Professional Accounting program from CSU-Global consists of a series of graduate professional accounting courses. This 30 credit program consists of 24 credits of required graduate professional accounting courses, and 6 credits of elective coursework.